Here you can find answers to questions like: I am 5 months old. How old am i in horse years? What is the horse years equivalent for a 5 months human? 5 months are equivalent to how many horse months? You can use the this Horse Age Calculator also known as Horse Years Calculator to find your horse's age in horse years (horse's relative age), as if he/she were a human, or your age in horse years. (*) You can also type decimal values. For example: 1.5 = 1 year and 6 months. This calculator is based on the average lifespan of a healthy horse. Experts say that a one year old horse has roughly the age of a 15 years old human and a two years old horse has the age of a 25 years old human. After two years old the horses mature slowly, so that a 15 year old horse is roughly comparable to a 76 year old human (see the graph below). Horses that live indoors can live longer than horses that live outside. Note: There is no reliable method for calculating precisily how old your horse is in human years equivalent. So, it is possible to find calculators that show diferent values for the same human age. It is because there are different models to calculate the horses age. 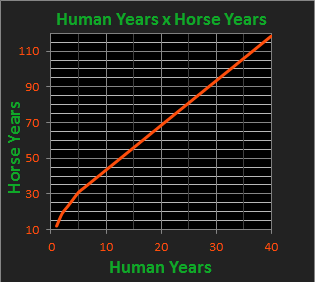 Approximate graph of horse age versus human age. How long do horses live on average? This is not a easy question, but most agree that, depending on the conditions in which the horse is raised (management and environment) and the breed. Most modern domestic horse has a life expectancy of 25 to 30 years. According to the chart below, under the age of one year old, there is really no comparison between human and horswe. A horse can walk shortly after birth, whereas humans do not walk until two years old, but a horse will walk within an hour after birth. A horse at birth has approximately the same physical capabilities and age as a two year old human. Generally, all aspects of growth are much faster for a horse than a human. Please keep in mind that the comparisons are not too accurate.